This isn't so much a recipe as it is a smattering of ingredients. 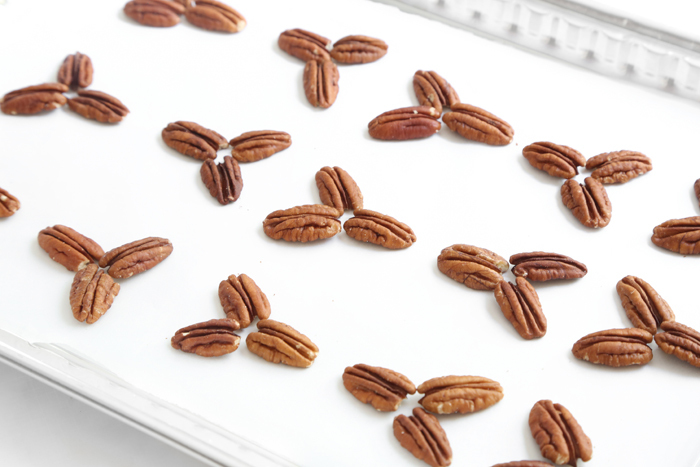 Place the pecans in groups of three on a parchment-lined baking sheet. 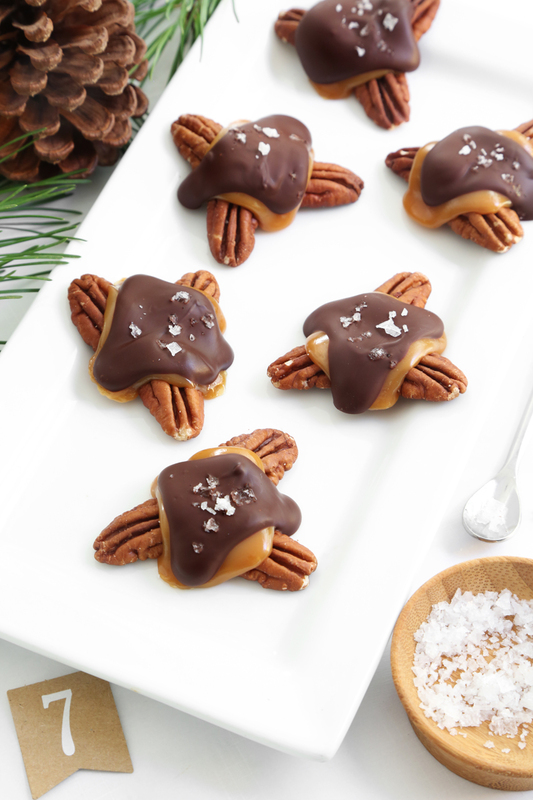 Flatten candy caramels by pinching them between your fingers and place them in the centers of the pecan groups. 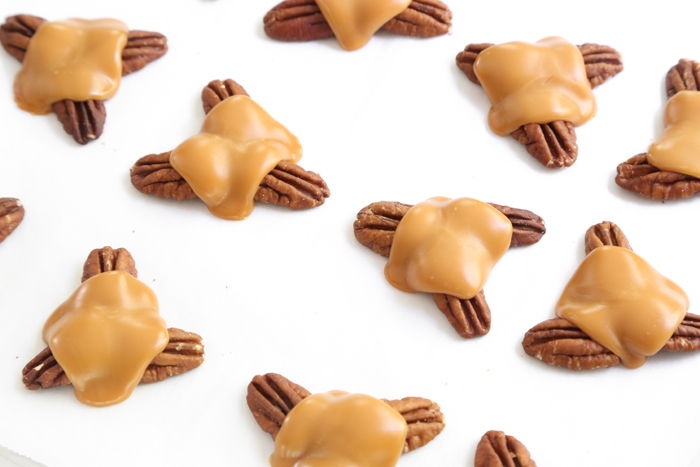 Place in a hot oven and bake for about 8 minutes, or until the caramels melt and drape themselves over the toasting pecans. 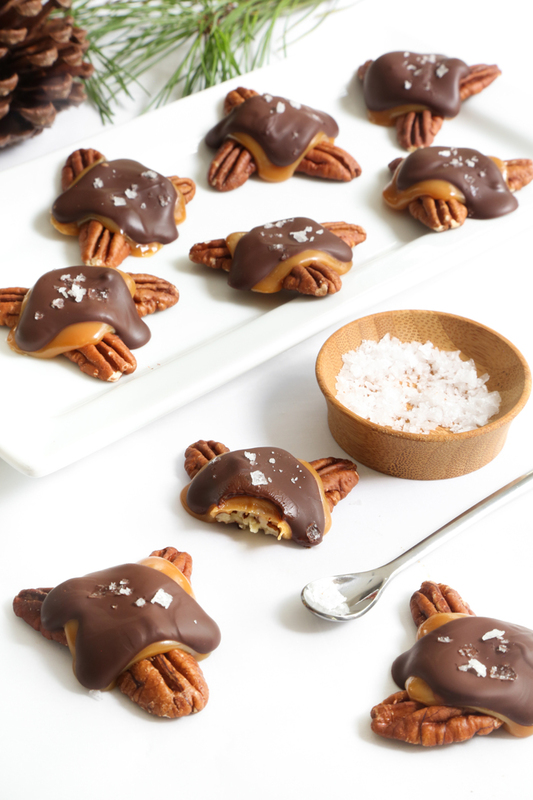 I love bittersweet chocolate on these turtles because it tastes a little more grown-up, but not everyone is accustomed to such a sharp chocolate. Semi-sweet or even mild milk chocolate are more widely appreciated. 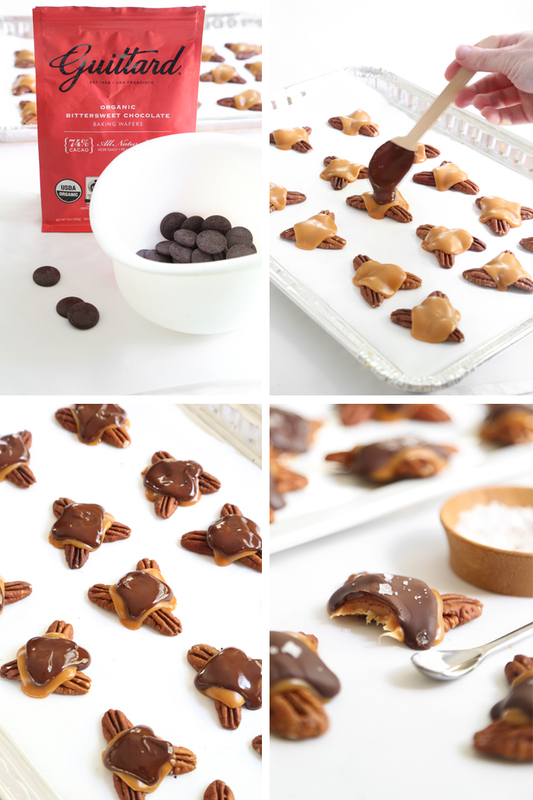 A sprinkle of sea salt is optional but totally delicious set against chocolate, toasty pecans and caramel. 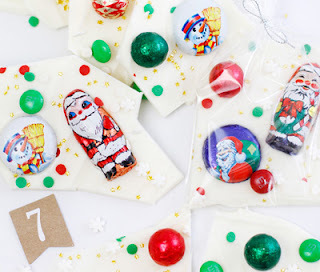 I like to put these in gusseted cellophane bags for stocking stuffers, or you can put them in little candy boxes for a fancier presentation. Place three pecan halves in a Y-shape on the parchment paper. Repeat with remaining pecans. 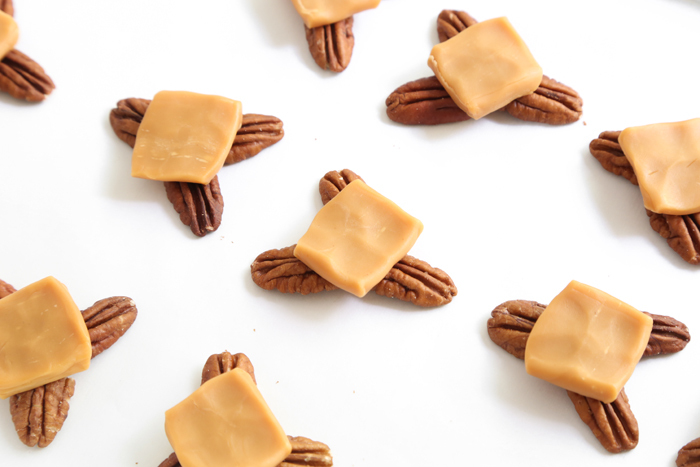 Flatten caramel candies slightly and then place in the center of each pecan bunch. Place in the oven and bake just until caramel is melted, about 6 to 8 minutes. Remove from oven and let the candies cool on the pan. Combine shortening and chocolate in a microwave-safe bowl and heat at 30 second intervals until completely melted (about 1 minute). Spoon a dollop of chocolate on top of each caramel. Let stand for 2 minutes; sprinkle with sea salt if desired. Refrigerate until set, about 5 minutes. Heather’s notes: Semisweet chocolate is the usual covering for these candies, but I love using bittersweet chocolate. This gives the turtles a more grown-up flavor. Consider the kind of chocolate your guests or gift recipient loves most. Milk chocolate and semisweet chocolate are usually the most crowd-friendly. The addition of shortening keeps the chocolate from blooming (developing chalky spots). If you don't like using shortening it can be omitted from the recipe. These caramel candies are almost too firm to eat right out of the refrigerator. Allow them come to room temperature before serving them. I like bite size sweet treats like these turtle candies! And I bet they taste divine with bittersweet chocolate! Thanks for the idea!